Sometimes I get this urge to share how... different I am from when I started this blog six years ago. But there’s just too much to fit in a blog post. I wish I could just have you all over for cupcakes and tea and sit around in my little studio space and pour out all of my heart to you. It feels like that, sometimes, on a blog. It’s weird how something so public can feel so intimate. For now, can I tell you? 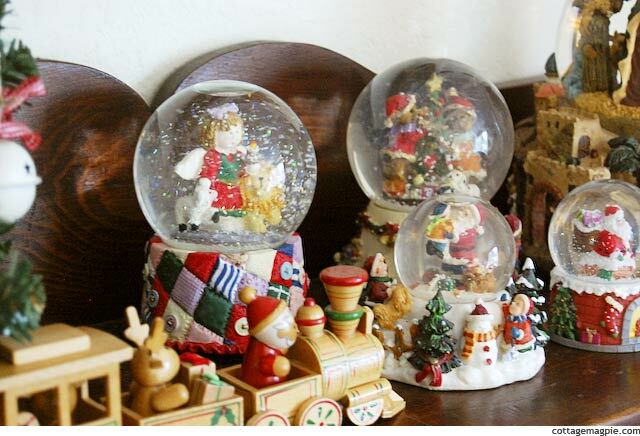 I have a new collection of thrifted snow globes. They have teddy bears in them (bears! ), and rag dolls, and snowmen, and Santa Clauses, and I love them. They make me giggle with happiness. I am sure this is unremarkable to you (or crazy), but to me it’s like a newly planted flag in undiscovered territory. I have never owned snow globes before, EVER. Or Christmas PJ's, or whirligigs, or a Christmas quilt, or any of the other things that I am finding & making this season that fill me with joy. Why? Because I believed the critical voice inside that said they were too cutesy or too tacky or not stylish or sophisticated or any of the other things that I thought I had to be in order to be a person of worth. Because I did not believe that the person I am, my true authentic self, was a person of worth. So for me, to have these things, to feel such joy this Christmas... it's like magic. It is. I can't stop talking about it. I can't stop reveling in it. I know it seems trite, or silly, or lame, to be amazed by something that so many people take for granted as being so simple. And I apologize in advance for the outpouring of happiness and gushing that's happening here, because I know for some people this is a painful season. But if you have ever been lost, not knowing who you really were, you will understand how precious it is to me to finally know. What about you? Do you know who you are?